Are you suffer from stubborn acne? Do you have best one for you? If you suffer from acne, it can be very difficult to find a good body wash which can provide a relief from acne while cleaning your skin efficiently. Most body washes available in the market are full of chemicals and can aggravate the condition rather than treating it. Body acne can not only be uncomfortable but it can also lead to other infections. If you are looking for a good body wash for acne-prone skin, here are ten body washes which are known for their soothing formulas. We have also compiled a list of different types of body acne so that you can choose the body wash accordingly. Available in three variants made up of natural extracts of lavender, sweet almond oil, vitamins, cactus flower, and minerals, this body wash comes in two size options. The pump packaging is convenient to use and helps prevent product wastage. The formula is free of parabens and artificial colors and is suitable for all skin types. It soothes the skin and leaves it feeling fresh and clean. This body wash calms the senses and works on the existing acne to reduce them gradually. It has a very mild and soothing fragrance which lingers on the skin for quite some time. The consistency of the body wash is neither very thin nor very thick and it is quite easy to rinse. The price of the body wash is affordable as compared to the quantity. The soothing variants are made up of natural plant extracts and are very gentle on the skin. It is available in two size options and the pump packaging is quite convenient. The calming aroma of the body wash reduces inflammation and keeps the skin feeling fresh. The price is affordable as compared to the quantity. The scent might be a little flowery for people who prefer smoother muskier scents. It is not very moisturizing for extremely dry skin so you will need a separate moisturizer for very dry skin. This body wash from ApotheCARE is not only very gentle and soothing on the acne-prone skin but it also cleans the skin very well. It has a rich fragrance and is easy to rinse. The three variants allow you to choose your body wash according to the ingredients. Tea tree oil is known for its antifungal and antibacterial properties and this body wash from Purely Northwest uses this oil to build the skin’s natural defense against germs. This body wash comes in a standard plastic packaging with a regular cap. The main ingredients of the body wash include aloe vera, sea kelp, vitamins, tea tree oil, eucalyptus oil, and peppermint oil. The formula is gentle and helps to keep acne under control. It also keeps body odor away and keeps your skin feeling fresh all day long. It also keeps bacterial and fungal infections under control if you use it regularly. The fragrance of the body wash is a bit strong so people with sensitive skin should avoid using too much of body wash. The price of this body wash is moderate and the quantity is good for 2-3 months of regular use. Uses tea tree oil and aloe vera to hydrate the skin and keep acne under control. Peppermint oil refreshes the skin and kills bad bacteria. The formula is quite hydrating and is suitable for dry skin. The body wash works well for bacterial and fungal infections. The packaging can lead to product wastage as too much product can get poured out. Tea tree oil can cause a tingling sensation on the skin and cause redness if not rinsed properly. The tea tree oil-based formula cleans the skin and keeps germs under control to avoid skin infections. It kills the acne-causing bacteria and prevents future breakouts too with its mild yet effective formula. With 17 sizes and 12 variants to choose from, this body wash from Dove offers something for every skin type and is one of the most popular body washes available in the market for acne. It has a hypoallergenic formula which is quite gentle on the skin and reduces skin inflammation and redness if you use it regularly. The formula is soap-free so it does not cause any skin irritation. This body wash is good for dry skin and sensitive skin as it minimizes dryness and provides long-lasting hydration. The mild cleansing agents used in the formula clean the skin effectively without stripping away the natural oils and keep the acne under control. The creamy consistency lathers well and is easy to rinse. The body wash has a musky fragrance which can seem a little strong to some users. The price of the product is moderate as compared to other body washes available in the market. Is available in multiple size options and 12 different variants to choose from according to your skin type. The packaging is quite lightweight and is easy to use while traveling. The hypoallergenic formula with mild cleansing agents leaves the skin feeling soft and smooth. It has a creamy consistency with a faint musky fragrance which refreshes the skin without aggravating the acne. The body wash is not very suitable for oily skin as it can leave the skin feeling greasy and oily. The price is higher than some of the other body washes available in the market. The number of different variants available in this body wash makes it suitable for people of all skin types. The rich and creamy formula with its fresh fragrance cleans the skin well and does not cause any further breakouts due to its hypoallergenic nature. If you are looking for a gentle body wash which does not dry out your skin, this body wash from CLn is a good option to consider as it is hypoallergenic and free of chemicals and artificial fragrances. Regular use reduces dryness and flakiness and gives relief from redness due to acne. The formula is suitable for daily use and uses sodium hypochlorite to keep acne away. It is also suitable for eczema and does not irritate the skin in any way. The body wash gives visible results in just a few weeks of usage and clears acne completely in a few months. The packaging is compact and easy to use. It is travel-friendly as well. The price of the body wash is a little high as compared to the quantity. Medicated formula reduces dryness and provides relief from itchiness and flaking. Controls acne breakouts and provides visible results in just a few weeks. The formula is free of parabens and artificial fragrances which can aggravate acne-prone skin further. It comes in a travel-friendly packaging which is compact and lightweight. The price of the body wash is high and the quantity is lesser than other body washes. It does not lather as well as other formulas according to some users. The formula of this body wash is very gentle on the skin and it provides quick results as far as acne is concerned. The unscented formula is suitable for all skin types and reduces dryness and flakiness significantly. Made with aloe vera, coconut oil, and sea kelp, this body wash from Aleavia is formulated using 100% natural plant-based ingredients which balance the pH of the skin and control acne breakouts effectively. The body wash comes in a standard plastic bottle with a cap. Regular use not only prevents itchiness and rashes but also reduces acne to a great extent. The body wash moisturizes the skin and penetrates the deeper layers of the skin to deliver moisture to the skin cells. It also exfoliates the skin and removes dead skin cells. Another advantage of this body wash is that it can also be used as a shampoo and a face wash in addition to a body wash. The quantity of the shampoo is great as one bottle lasts for 2-3 months if used daily. The price is moderate as compared to the quantity. It is made up of 100% natural plant-based ingredients which nourish the skin without aggravating the acne. Moisturizes and exfoliates the skin to keep acne under control without causing excessive dryness. Has a very faint fragrance and balances the pH of the skin with regular use. The quantity of the body wash is good as compared to other body washes of the same value. The packaging is a little bulky for traveling purposes. It does not lather much and is a bit difficult to rinse off completely. The 100% natural formula of this body wash is suitable for all skin types, particularly acne-prone skin. It hydrates the skin and removes dead skin cells to reduce itching and redness. Aloe vera and coconut oil soothe the skin with regular use. Suitable for people of all ages, this body wash from Essential Oil Labs detoxifies the skin during each wash and provides antibacterial and antifungal benefits. It keeps itching and infections under control and prevents ringworm, athlete’s foot, and other fungal infections. The formula is easy to rinse and does not leave any residue on the skin. It has a soothing and pleasant fragrance which lingers on the skin for quite some time. The bottle comes with a pump so it is easy to take the product out without having to lift the bottle. The body wash is great for people who lead an active lifestyle also as it keeps body odor under control and is free of harsh chemicals so you can use it for all skin types. The price is affordable as compared to other body washes available in the market. The formula detoxifies the skin and prevents skin infections and acne. It keeps body odor under control and is easy to rinse off the skin. Tea tree oil refreshes the skin and kills acne-causing bacteria. The price of the product is affordable and the quantity is good. The concentration of natural tea tree oil in the formula is very less. The fragrance of the tea tree oil-based formula can be too strong for some users. This body wash is great to keep body odor in check and has many antibacterial properties which maintain the health of your skin. Tea tree oil in the formula works as a powerful antibacterial agent and kills acne-causing bacteria. Formulated using natural citrus extracts and sea salt, this body wash uses coconut oil as a base to nourish and hydrate the skin. The body wash has a fresh ocean fragrance and cleans the skin gently to keep acne under control. It is free of sulfates, parabens, other artificial chemicals and fragrances. The formula is suitable for both men and women and for daily use. The packaging of the body wash is quite lightweight and user-friendly. The pump allows the user to take the product out of the bottle easily. The pink sea salt gently exfoliates the skin and the citrus extracts refresh your skin. You can also use this body wash for sensitive areas like underarms and intimate region. The price of the body wash is high but you can get it at a good discount online. The pink sea salt and citrus extracts clean the skin and control body odor. The formula is free of harmful chemicals and artificial fragrances which can be harmful for the skin. It is suitable for daily use and can be used by both men and women. The pump packaging is easy to use and dispenses just the right amount of product. It can dry out your skin if more product is used than required. The formula does not control body odor very effectively if you lead an active lifestyle. The fresh citrus extracts and the pink sea salt make this body wash perfect for people who want gentle exfoliation along with cleansing. It is great for all skin types and has a soothing scent which refreshes and energizes the skin. Available in fragranced and fragrance-free versions, this body wash is suitable for people with acne-prone skin as it does not contain any harmful chemicals or fragrances. It is made using natural botanical extracts, vitamins, and minerals which clean the skin and reduce breakouts. It has a toxicity rating of 0 so there are no ingredients in the formula which are harmful to the skin in any way. The formula contains 9 ingredients which are certified organic so they do not irritate the skin in any way. It comes in a BPA-free plastic bottle with a convenient cap. The consistency of the body wash is slightly thick and it is dark in color. The body wash is suitable for all skin types and lathers well without any chemical-based lathering agents. The quantity is lesser than other body washes available in the market and the price is very high for the quantity. It is available in both fragranced and fragrance-free versions so you can choose according to your skin type. The formula contains 9 certified organic ingredients which have a soothing effect on the skin and reduce redness and itching. It has a toxicity rating of 0 which means there are no harmful ingredients in the formula which can aggravate the acne. It is easy to rinse and lathers well on the skin. The quantity of the body wash is less for the price. The consistency is a bit thick according to some users. This body wash is great for all skin types and reduces acne significantly as it contains certified organic ingredients. It lathers well and cleans the skin without using any harmful lathering agents. Specially formulated for common skin conditions like acne, eczema, and psoriasis, this body wash is available in two sizes to choose and uses aloe vera as the main ingredient. The formula is free of parabens and sulfates. It is non-medicated so you can use it as often as you need. The formula is suitable for both kids and adults and works well for all skin types. It also contains Manuka honey and Cehami extracts apart from aloe vera. These ingredients act as natural moisturizers and cleansing agents for the skin while providing relief from itching and redness. The packaging is quite normal and it comes in a standard plastic bottle. The quantity is good as you can use one bottle for at least a couple of months. The price is a little higher than other body washes but the natural ingredients make it worth the high price. It uses aloe vera, cehami extracts, Manuka honey, and vitamin E to nourish and clean the skin while reducing acne. The packaging is lightweight and user-friendly. The formula is suitable for people of all ages and can be used by both men and women. It has a mild and soothing scent of aloe vera which lingers on the skin. The price is relatively higher as compared to the quantity. It does not work very effectively against cystic acne. The Manuka honey and vitamin E in the formula work effectively in controlling breakouts as they nourish the skin and kill germs naturally. It does not lather much but it cleans the skin very effectively and is suitable for all skin types. One of the most popular body washes for acne, the Neutrogena pink clear body wash is specially formulated for acne-prone skin. It is available in two sizes and three variants to choose from and is made using Microclear technology to reduce clogging of pores. The formula contains salicylic acid which is very effective against acne. It also contains natural grapefruit extracts and vitamin C which are known to improve skin health with regular use. The consistency is very thin and lathers well to clean the skin effectively. It contains microbeads which exfoliate the skin and remove dead skin cells. The formula does not have a very strong scent and is suitable for all skin types. The price is quite affordable as you get three bottles at the price of one. This body wash is made for acne-prone skin and uses salicylic acid to reduce acne. Two size options and three variants make it easy to choose the body wash according to the skin type and usage. Lightweight and bubbly consistency with micro beads which exfoliate the skin. Has a mild scent which does not irritate the skin or cause any further breakouts. The plastic microbeads do not dissolve properly on the skin and cause many environmental issues. The body wash contains chemicals which can harm the skin in the long run. This bubbly body wash is great for morning showers as it energizes the senses and refreshes the skin. The salicylic acid in the formula helps to prevent acne and controls existing acne also. These are flat acne breakouts which are red and sensitive to touch. They are not extremely inflamed but can cause pain if pressure is applied. Papules can leave scars so it is advisable to not touch them frequently with bare fingers as this can transfer bacteria to other parts of the body. This type of acne is quite inflamed and painful. It is a little hard on the surface and is filled with pus. This acne occurs mostly on the back, groin region, and armpits. They settle on their own but you can apply aloe vera gel on the acne to subside the inflammation. Aloe vera gel also cools down the skin and prevents the acne from leaving marks on the skin. This acne is bigger in size as compared to pustules and papules and is a little tender to touch. It is also quite inflamed and can be painful to touch. Nodules are filled with pus and can take longer to heal as compared to other types of acne. You should consult a dermatologist to get proper products which can treat this acne effectively without leaving any permanent scars. Cysts are different from other types of inflammatory body acne as these contain sacs filled with pus and are softer as compared to other types of acne. They go deep into the skin and can be very painful. They are normally treated by trained dermatologists who drain the cysts and then apply anti-inflammatory creams on the affected area. Do not apply over the counter medications on cysts. Non-inflammatory acne breakouts most consist of blackheads and whiteheads and are not very painful or severe. These breakouts occur mostly on the face are also commonly found on other parts of the body like back and legs. Blackheads are also called open comedones and are caused when a skin follicle is blocked due to dead skin cells, oil, or bacteria. They can be removed simply by steaming the affected area to open the pores and scrubbing the skin gently. Whiteheads, on the other hand, are called closed comedones and are oil glands which got clogged due to excessive oil production. The oil then struggled to reach the surface of the skin and gets trapped under the layers. These blocked oil glands can result into whiteheads. They usually affect people with excessively oily skin. Washing your skin with an oil-free body wash 2-3 times a day helps in controlling excess oil in the body. These are the main types of acne occurring in the body and all these types require different treatments to get your clear skin back after a breakout. Please note that every skin is different and it needs proper care and diet to look clear and healthy. Apart from these common types of acne, there is one more type which occurs in both men and women. It is called the Acne Conglobata and is a rare skin condition. This type of acne occurs in large patches of skin and can cause permanent skin damage if not treated properly. It mainly occurs on the back, chest, and buttocks. This is a very rare type or acne and can also require invasive dermatological procedures to treat it completely. Always make sure that you do not touch active acne with bare hands as this can transfer the germs to the other parts of the body and can lead to more acne breakouts. Do not pop the acne even if it looks ready because popping it can leave permanent scars on the skin and aggravate the condition further. Keep your personal belongings clean and do not share any belongings like towels, soaps, or loofahs. Wear clean clothes every day to prevent accumulation of germs due to excessive sweating. Use products which contain natural tea tree oil as this ingredient works wonders on acne and clears up the marks as well. Using a hot compress on acne also helps to clear up the inflammation and helps the acne to mature quickly. Use skincare products free of chemicals like parabens, sulfates, artificial fragrances, and dyes as these chemicals can irritate the skin in the long run. Adopt a healthy lifestyle with some exercise to detoxify your skin and prevent breakouts. Eat proper diet including fruits and vegetables and stay away from junk food which worsens the condition. Look for non-comedogenic products which do not clog the pores as clogged skin follicles are the major causes behind body acne. Choose your hair care products also carefully. S the shampoo and conditioner washes down, it comes in contact with the skin on the back and can lead to acne breakouts. So this was our detailed guide on best body washes for acne which are known for their gentle formula and effectiveness against acne. Different types of body acne are also discussed in detail above to that you can understand which type of body acne you are suffering from. This will help you find the right body wash for your skin type and acne type so that you can get relief from the acne easily. Dealing with body acne requires patience and using the right products will give you the desired results sooner or later. Have you used a body wash for acne? Which one is your favorite? I wonder if body wash clog pores? Bacteria and sweat can block your pore and burst acne. So, using body wash for acne is a great way to cleanse your body skin and make sure that your pores stay freely. I love working out and I found it’s easily to have acne on the back. How do I prevent it? A quick shower is the best way to help you prevent back or body acne after workout. I suggest you wait until your sweat dry and your body cool before having shower. Using antibacterial soap is a good one to keep you deep clean and clear skin. CLn Moisturizing Body Wash is very helpful. It’s great performance. 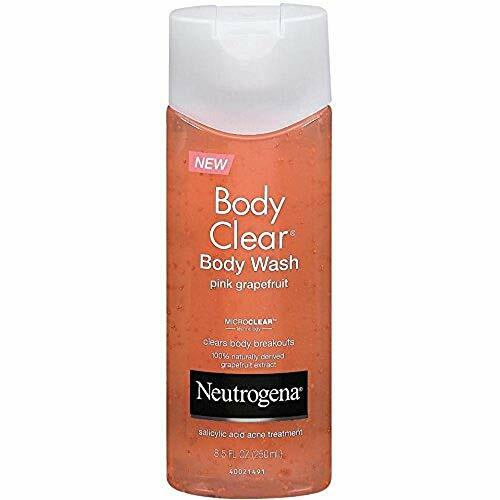 I’ve grown to like Neutrogena Body Clear Body Wash due to its visible performance.